Asbestos is a naturally occurring silicate mineral that became popular among manufacturers and builders in the late 19th century because of its sound absorption, average tensile strength, and its resistance to fire, heat, electrical and chemical damage. It can be positively identified only with a microscope. Asbestos is described as a hidden killer because it's impossible to identify without proper analysis. Asbestos fibres are extremely fine and can remain suspended in the air for hours. If not handled correctly, homeowners and workers are in danger of inhaling asbestos in the air. If an exposure occurs, serious chronic health problems such as asbestosis, mesothelioma and lung cancer can occur. These diseases take years to develop and do not affect you immediately when you're exposed to asbestos. And it's too late for corrective treatment once these diseases have been diagnosed. You should protect yourself immediately. Some roofing and siding shingles made of asbestos cement. Asbestos as insulation between 1930 and 1950. Asbestos in textured ceilings and drywall compounds used on wall and ceiling joints. Vinyl floor tiles and the backing on vinyl sheet flooring and adhesives may contain asbestos. Please see diagram at the bottom for more information regarding asbestos and where it may be located. How can I know for sure if there's asbestos in my home? You can't tell whether a material contains asbestos simply by looking at it, unless it is labeled. Treat suspected material as if it contains asbestos or have it sampled and analyzed by a qualified professional. A professional should take samples for analysis, since a professional knows what to look for, and because there may be an increased health risk if fibres are released. In fact, if done incorrectly, sampling can be more hazardous than leaving the material alone. Taking samples yourself is not recommended. What should I do if asbestos is found on my property? Don't panic! Usually the best thing is to LEAVE asbestos material that is in good condition ALONE. Generally, material in good condition will not release asbestos fibres. THERE IS NO DANGER unless fibres are released and inhaled into the lungs. Check material regularly if you suspect it may contain asbestos. Don't touch it, but look for signs of wear or damage such as tears, abrasions, or water damage. Damaged material may release asbestos fibres. This is particularly true if you often disturb it by hitting, rubbing, or handling it, or if it is exposed to extreme vibration or air flow. If asbestos material is more than slightly damaged, or if you are going to make changes in your home that might disturb it, repair or removal Dy a professional is needed. 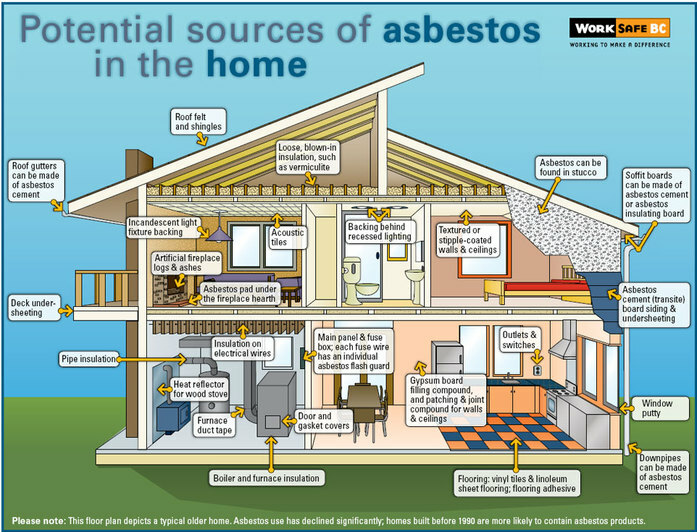 Before you have your house remodeled, find out whether asbestos materials are present. What do I have to do before work begins on the demolition, renovation, or salvage of buildings or structures? The employer, owner/builder, agent, or property manager must have a qualified person inspect the site to identify any asbestos that may be handled, disturbed, or removed. OHS Guideline G6.6-3 outlines the acceptable qualifications for persons conducting asbestos hazard assessments. What are my responsibilities as an employer or owner/ builder? What should I do if I find asbestos-containing material (ACM)? All ACM must be properly removed and disposed of by trained and qualified asbestos workers before demolition, renovation, or salvage work begins. A notice of project for asbestos (NOPA) must be submitted to WorkSafeBC at least 24 hours before asbestos removal, demolition, renovation, or salvage work begins. After the asbestos removal, the owner or employer should receive written confirmation that the asbestos specified for removal on the NOPA has been properly removed. If asbestos-containing materials that were not identified during the inspection are found during work activities, stop work immediately! Have trained and qualified asbestos workers remove these materials before resuming work. WorkSafe BC prefers AHERA Building Inspectors when suspect hazardous materials are inspected and/or sampled. An AHERA inspector is one who's obtained the AHERA Building Inspector accreditation. Signed into law in 1986 in the United States and amended in 1994, AHERA mandates specific training and "accreditation" for all individuals doing inspection, project design, project supervision, and project work involving asbestos in buildings. Asbestos-related lung cancer looks the same as lung cancer caused by smoking and other substances. Researchers have shown that the combination of smoking tobacco and inhaling asbestos fibres greatly increase the risk of lung cancer. Asbestosis is a serious scarring condition of the lung that normally occurs after heavy exposure to asbestos over many years. This condition can cause progressive shortness of breath, and in severe cases can be fatal. Mesothelioma is a cancer which affects the lining of the lungs (pleura) and the lining surrounding the lower digestive tract (peritoneum). It is almost exclusively related to asbestos exposure and by the time it is diagnosed, it is almost always fatal. Pleural thickening is generally a problem that happens after heavy asbestos exposure. The lining of the lung (pleura) thickens and swells. If this gets worse, the lung itself can be squeezed, and can cause shortness of breath and discomfort in the chest.